- Petroleum, Paraben, & SLS Free. Yes To Cucumbers Soothing Eye Gel is suitable for sensitive skin. *Keep in the fridge for the ultimate cooling and soothing experience. 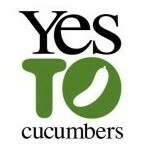 Gently dab a bit of Yes To Cucumbers Soothing Eye Gel around your eye and smooth into skin. You'll feel the calming, cooling difference, immediately! - Organic Cucumbers are packed with rejuvenating vitamins which soothe and soften the skin, Cucumbers also having cooling properties which help keep your skin supple and fresh. - Green Tea has excellent anti-inflammatory properties to improve the general health of the skin, provide superior protection against free radical damage and help rebuild damaged skin cells. - Chamomile soothes and tightens the delicate skin around your eyes. - Also includes: Broccoli Extract, Dill Extract, Dead Sea Silt Extract, Spinach Leaf Extract. Aqua (Water), Cucumis Sativus (Cucumber) Extract*, Sodium Alginate, Aloe Barbadensis (Aloe Vera) Gel*, Chamomilla Recutita (Camomile) Extract*, Brassica Oleracea (Broccoli) Extract*, Citric Acid, Peucedanum Graveolens (Dill) Extract*, Capsicum Annuum (Green Pepper) Extract*, Algin, Algea (Spirulina, Rhodella, Dunaliella) *, Maris Sal (Dead Sea Minerals), Parfum (Fragrance), Spinacia Oleracea (Spinach) Extract, Benzyl Alcohol, Tocopheryl Acetate (Vitamin E) *, Panthenol*, Dehydroacetic Acid. I bought this with my weekly shop at the supermarket when it was on special offer. It is a smaller version of 15ml which comes in a simple tube with a screw top. The product is a clear gel which has an instantly cooling effect when applied to the eye area. It is a great pick-me-up after a sleepless night or to refresh tired eyes in the evening. It is great to apply when energy levels are flagging or when you are feeling eye strain, as your eyes feel instantly refreshed and your mood is lifted. I always prefer to use gel based formulas around my eyes as they are easily irritated by cream based products. This eye gel comes in a practical and sanitary airless pump bottle and has a lightweight clear gel consistency. The formula contains 98% natural ingredients including Dead Sea minerals, organic cucumbers, aloe vera, green tea extracts and chamomile. You only need a small pump for both eyes but I did find that this pump over dispenses, probably enough for two applications so I have to try hard to use a half pump so as not to waste the gel. The gel has a lovely powdery, fresh cucumber fragrance and absorbs rapidly into the skin without leaving a sticky residue. You do feel a slight cooling effect and this product does effectively reduce puffiness and calm irritation. What better thing would you want on your peepers than cucumbers? Well this product is better than cucumbers, as well as cooling the eyes, it revitalises them, reduces swelling a little and helps with dark circles. So light, it absorbs really well and eyes look more awake. Perfect for summer or those mornings when you are feeling a little worse for wear.